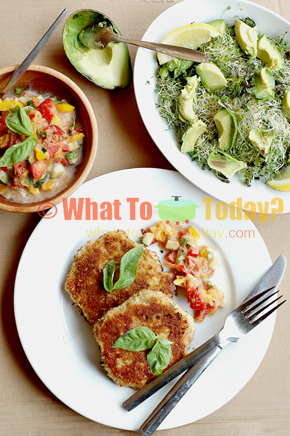 I decided to give this Swedish fish cakes with avocado sprout salad a try from Jamie’s 30 Minute Meals cookbook with some modification on the salad. I think I’ve mentioned before that both my husband and I are not too big of a fan of cooked salmon. We love raw salmon served in sashimi. 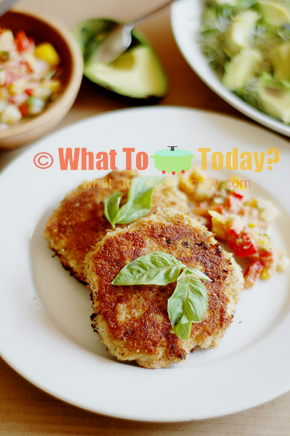 This Swedish fish cakes recipe uses 3 different type of fishes: salmon, haddock and tuna. The combination is delicious. The fish cakes is served with fresh salsa, which is tangy and sweet in taste, perfect with the fish cakes. I recently also became a fan of eating alfalfa sprouts after trying Jamie Oliver’s fiery shrimp cocktail, which was served with alfalfa sprouts. Topped it with avocado and it taste even better. 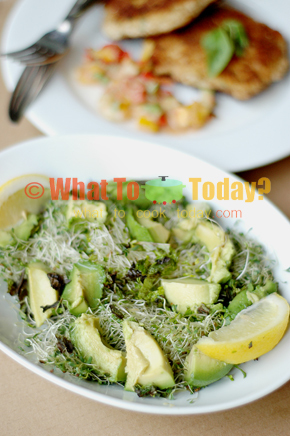 Alfalfa + Avocado….wow…super food I’d say! 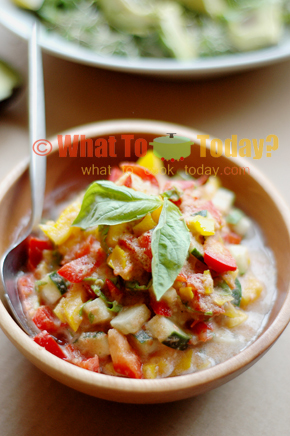 This meal is hearty and super satisfying! what a deal!